Mudflats occur in temperate and polar regions on places where the velocity of the water is so low that the finest particles can settle on the bottom. Generaly mudflats are formed sediments supplied by nearby rivers. In warmer regions mudflats mostly are covered by mangrove trees, mangroves replacing the mudflat communities. Like in sandy areas biodiversity of bottom organisms in mudflats is not very high. Not many species are adapted to the specific physical conditions, their abundance is high though. However this absolutely doesn't mean that the contribution to world's biodiversity is low. 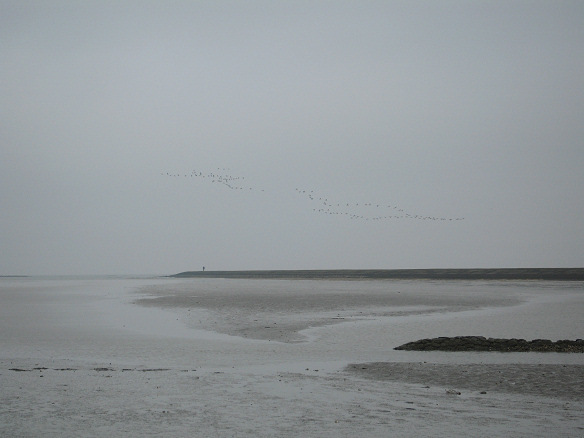 Mudflats are very important habitats that support huge numbers of birds and fish. They provide both feeding and resting areas for waders and waterfowl and also act as nursery areas for flatfish. On mudflats the start of the food chain, or the primary production, is partly different from other area's. In addition to macroscopic and microscopic algae living on the surface also sulphur bacteria produce organic matter. These bacteria use the energy in sulphur compounds to produce organic mater whereas plants obtain their energy from sunlight. Apart from the joint food production by plants and bacteria the mud also contains many organic particles that can serve as food. 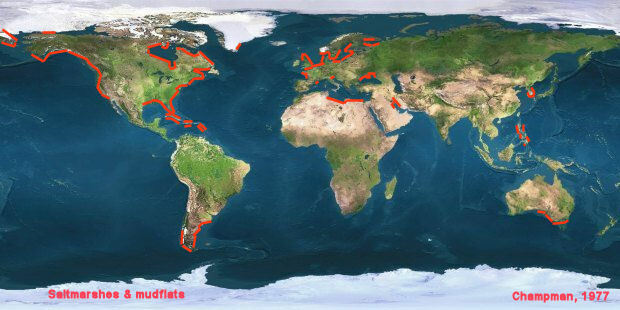 The result is that there is much more food available then in sandy area's and hence population densities are high. 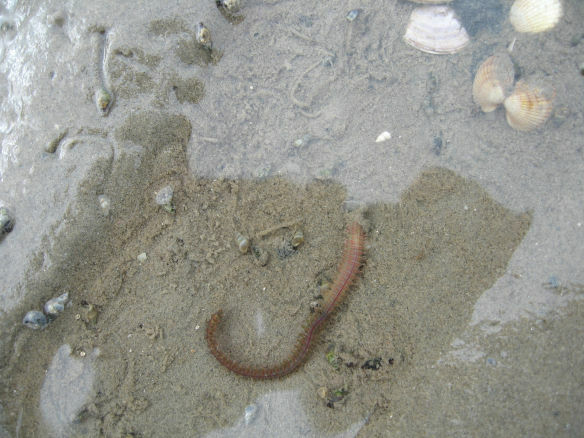 Many worms and clams live on the organic particles and bacteria in the mud (deposit feeders). Other species of the same groups and some crustaceans live by pumping seawater to filter out the plankton organisms. With all those animals in the bottom it is no wonder that many rays, flatfish and birds are attracted. Flatfishes will catch only animals living near the bottom surface but rays and some birds will dig to considerable depths to find their food. 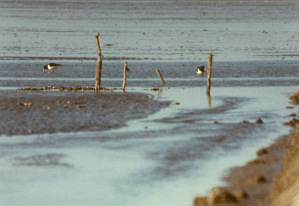 Intertidal mudflats are very important for migrating birds. During migration they visit the flats to increase their fat reserves before flying further to area's where the food supply is less certain. Especially waders are very dependent of the flats for their survival. One could say that mudflats benefit from the fact that they are visited by so many birds. Many countries signed agreements to protect migratory birds against habitat loss thus promising to protect their wetlands. This doesn't mean that mudflats are safe, agreements are just starting points for protection of vulnerable area's. Mudflats were considered wasteland in the past. Large areas were claimed for development. Even today diking and dredging activities continue to pose a threat to these intertidal flats. A negative factor to live on mudflats is overexploitation; especially intensive shellfisheries can make irreversible changes to these tidal areas. Also excess of nitrogen and phosphorus from fertilizer runoff has his negative impact. It can cause 'algal bloom' followed by depletion of oxygen which leads to the death of the animals living on or in the bottom. The vulnerability of mudflats to the rising sea level as a result of global warming is disputed. Tidal flats are dynamic environments where changes in water movement influence the sedimentation of sand and silt. It is uncertain if the sea-level rise will proceed too fast to be compensated by extra sedimentation.